Sage Cleansing Sticks - ThaBadbrey Herbal. Dried Californian White Sage has been used for thousands of years to aid in the process of Spiritual Cleansing. As seen in the image shown, once lit, the “Sage Smudge Stick” (as it’s colloquially referred to within the Conscious/Spiritual Community) begins to give-off an “Incense-like” emission of what seems to physically appear to be common “smoke”. The scent is somewhat potent while managing to simultaneously remain gentle & relaxing. How does it achieve this amazing feat you may ask? Astrologically speaking, Sage is an herb believed to be under the planetary rulership of Jupiter. This planet in turn rules the astrological sign of Sagittarius, which in turn is a sign of the zodiac known for governing the Liver. From a biological perspective, the Liver is the internal bodily organ known for its ability to cleanse/purify the blood, as well as possessing the capacity to independently (an almost spontaneously) renew/regenerate itself, even after suffering damage as a result of many years of abuse and/or misuse. Now, not only is the Liver one of the main “Blood Purification Stations” of the human body, it also coincides with, and is the main vibrational biological implementation device utilised for the Spiritual Cleansing, Cultivation, Purification and/or Regeneration of the many Higher Vibrational centres, of which comprise and/or encapsulate the human Aura. Put simply, it not only purifies the blood, it also cleanses “Us” on a Spiritual level. From the perspective of an Astrologer/Herbalist, the Liver’s ability to simultaneously carryout purification in both of the aforementioned physiological/spiritual areas within the auric vibrational field of human beings, is an obvious axiom, and makes complete sense. Why? You may ask….. The Astrological sign of Sagittarius, which governs the Liver, is ruled by Jupiter and is a native of the 9th House of the zodiacal wheel. The 9th House is renowned for being the House of spiritual-growth and/or spiritual-cleansing in someway or another. Not only is this the case, but due to the fact that Jupiter also happens to rule the blood, (which also symbolises and contains the life-force of almost all living organisms on this planet) brings us full-circle & right back to the main point of this whole explanation, which aims to deal with the cleansing ability of the Californian White Sage Smudge Stick. Sage => Jupiter => Sagittarius => Liver => Blood-Purification => Spiritual-Purification => Sage! We have in the practice of Herbalism, Sage being taken (in conjunction with other blood cleansing herbs) as a means of cleansing the Liver and purifying the blood, while at the same time purifying and cleansing the spirit, thus creating a state of healing and Higher Vibrational Being within the individual who may be utilising it for this very purpose. Based upon my numerous visits to the “Akashic Hall of Records” (as well as in accordance with “Cosmic Law”), most herbs that can be used to purify the blood or the Liver on a physical level, can also be utilised in their dried form to spiritually cleanse any area or space, via the method of igniting and letting burn the said herb, within the designated or chosen area. 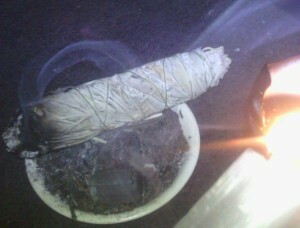 The subsequential smoke created by the burning of the “Sage Smudge Stick”, has the power to chase-down, chase-out and/or completely nullify any negative energy that may have previously existed within the area or vicinity, prior to it being lit. All negative entities are unable to withstand the positive Higher Vibrational Fumes, given off by this extremely cleansing & powerful herb, and tend to take their leave almost immediately. Positive entities on the other hand, tend to find these “fumes” gentle & relaxing, hence the reason why the scent emitted by the burning of this herb, is somewhat potent while managing to simultaneously remain gentle & relaxing (as I mentioned at the beginning of this commentary). Personally, I tend to completely saturate all areas of my home (including my clothes and personal belongings) with the scent of burning Sage, and I love how it smells! The “Sage Smudge Stick” is one of the best methods of cleansing and purifying any area or location, especially when moving into a new home, a brand new office/place of work or even when embarking upon a new career path. “Californian White Sage Smudge Sticks” of “Premium Quality” are available here at ThaBadbrey Herbal., at a relatively low price of just £10:00 per stick! Cleanse your Aura, your Home or your Office, with this wonderful Device of Spiritual Facilitation, Today! Sage Cleansing Stick (Californian White Sage) 8 Inches/20 cm Approx.